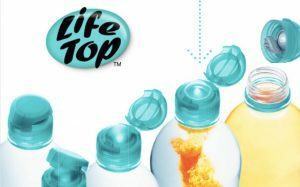 Swedish caps provider CapAble have launched the LifeTop cap which is designed for small volume sensitive ingredients, such as probiotics. The LifeTop cap is a patented bottle closure where sensitive powder ingredients are placed in a protective aluminium blister inside the cap. This protection makes the shelf life considerably longer than if the ingredients are mixed into the drink. When the top is pushed, the blister breaks open and the powder is released into the beverage. The packaging system handles room temperature storage and offers longer shelf life for the sensitive ingredients. Compatible with existing PET bottles and production lines the LifeTop cap is designed to fit standard bottlenecks meaning that customers can have a swift start with limited modifications of the production lines.